This week, we had ourselves a good ol' fashioned goalie duel for the Player of the Week nod and this one was a dilly of a pickle to tie-break, seeing as though they both had identical records in the week, 3-0-0 with a shutout for 8 points. When it comes to the player rankings, however, I give more onus on players who play more than the others, as their value is significantly worth more to me than a player who doesn't and with an overtime victory in his three wins, that is why Frederik Andersen of the Maple Leafs takes the nod over Pekka Rinne of the Predators. Andersen shutout the Panthers on Tuesday, beat the Islanders in overtime on Thursday and then defeated the Bruins on Saturday for his three wins, stopping 92 of 98 shots in the week to earn the honour, his first nod of the 2018 season. Despite his team's inconsistencies of being a youthful group, Andersen is stringing together a pretty good season, currently ranking 6th overall in pool scoring, 4th among all goalies, picking up 32 wins, 5 shutouts and an assist for 75 points in 53 appearances. This makes the Maple Leafs buyers at this trade deadline, as they are firmly in the thick of the playoff race. For Mike, however, his team is right in the middle of the standings, but his 16th overall pick in the draft is not at fault here, as he is getting more than his pick value at the moment. It's just a shame the rest of his team couldn't make those kind of bargains that Andersen has been this season. If Dale B. was going to repeat as pool champion this year, his team would have needed to stop the bleeding of the last few weeks with something of the 'very good' variety or better, so his team's 39 points in Week Twenty-One should fit the bill, especially since it was worthy of this week's Mover & Shaker nod. 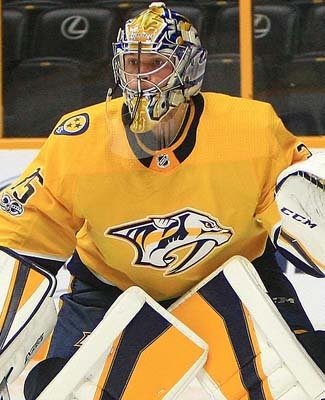 I hope no one felt bad for Pekka Rinne of the Predators, because he does get to have his picture posted in this Newsletter, despite losing out on the Player of the Week nod. His 8 points was the guiding light for Dale's team in the week, helping to get his team back on track and close down the gap to 2nd place, which is now down to 2 points. Also having a solid week for Dale's team was Mark Stone of the Senators with 7 points, Claude Giroux of the Flyers and Mitch Marner of the Maple Leafs with 5 points each and then Ryan Suter of the Wild had 4 points. It wasn't the most consistent Mover & Shaker weeks we've seen, as four players on Dale's active roster failed to get points, three of which were due to injury and the last one was just a cold streak. Dale's team does seem destined for some money this season, as his team has been consistently among the top five teams in each of the segments, so far, not having much of a drop off at all, minus a couple of less-than-stellar weeks. The most dubious distinction Dale's team actually has this year, is that it ranks last in the pool in games played by his forwards, with only 421 games collected by the eight active players up front this season. His team does rank tied for 1st for defenseman games played, with 248, and that seems to be making up for it. As Basement Dweller weeks go, we've seen some pretty good ones already this season and this week was one of those decent ones, as Ryan's team did finish last in the weekly scoring ranks, but he did so with the 2nd-best total of points this season, with 16. It didn't help his team in the standings, as his side still dropped a position, down to 23rd from 22nd, but it is something, I guess. Ryan's team got an okay week from both Antti Raanta of the Coyotes and T.J. Brodie of the Flames, finishing with 4 and 3 points, respectively, but five of his players finished without a point this week, two of which saw injury troubles in the week. Out of Ryan's 14 picks at the opening draft, only three of those players have rankings that are better than their pick position and they came from rounds 10, 11 and 12, and of the dud picks, only Mike Smith of the Flames (1st round) and Tanner Pearson of the Kings (8th) have rankings within 50 spots of where they were drafted. Luck was not on Ryan's side this season. After Week Twenty-One, we have seen the biggest end-of-week lead of the year, as Stuart's team has slightly pulled away, now leading Benson's team by 17 points. It's not insurmountable, but it is going to be rather difficult to overcome, now that we only have six weeks of regular season play left to go. It's going to be a tough slog, but it's possible. As we saw in the Mover & Shaker nod, Dale B. is closely moving in on Benson for 2nd place, as that gap is now 2 points for the spot, while there is still a pretty big gap between 3rd and 4th place, 35 points, even after Grant's team had consideration for top spot in the week, with 36 points. We might already have our top three teams this season. Finally, the plus/minus pool is anything, but safe after this week, as Dale B. 's Mover & Shaker week also translated well in this mini-game, as his team went and posted a +18 combined effort and his team now trails Steve's leading team by only 17 points. Steve's team got off to a bit of a rocky start I saw, but recovered to post a +7 after the seven days, as his team is now good for a +84 rating overall. With the NHL trade deadline upon us, I wanted to get this post done nice and quick, I am straight into the statistically speaking and I can confidently say that this past week was a slightly-below average week this season. The overall total for points was okay, we managed to collect 631 points as a whole, but it didn't look as good against the 52 NHL games played in the week, maybe thanks to the trade deadline scratches, who knows? Both participation from skaters and goalies were down, so that was slightly disappointing. After today's trade hooplah, hopefully everyone gets their acts together and we see some real scoring down the stretch. Here we go! With the Maple Leafs acquiring Tomas Plekanec from the Canadiens on Sunday (in a non-pool relevant trade), they had to make room for him on the roster and they did so by placing Auston Matthews on the Injured Reserve. Matthews is expected to miss the entirety of Week Twenty-Two, including the Stadium Series game this coming weekend and he will be reevaluated after that, in all likelihood. This is the sort of news which can start to sink Benson's team, especially if his team falls victim to the injury bug on a regular basis, not unlike what Brian and Jeremy have already seen this season. Benson's team finished the week in the money, but without Matthews, how quickly could his team possibly drop? Before Sunday night's game against the Anaheim Ducks, Edmonton defenseman Kris Russell was among the list of players scratched, not because of a desire to trade the defender, but rather, because of a hand injury, which he suffered Saturday night in Los Angeles, while blocking a shot. He's considered day-to-day for right now. Oilers forward Zack Kassian left the game in the 2nd period with an undisclosed injury, falling awkwardly on the ice after a collision behind the Ducks' net. It didn't look like too much, when it first happened, but it was obviously enough to knock out the tough guy. There was no word on his condition after the game. This was a lost skater-game for both Derek B. and for Wes on Sunday, but neither are figuring into the money this season, so this news may not figure too greatly moving forward. Wes already has a handle on the PIM pool, even without Kassian being healthy, which is about the only story line here. You can add Thomas Vanek to the list of players held out of contests, in order to keep their trade value up, ahead of today's trade deadline. The Vancouver Canucks held out the veteran forward from the game against the Coyotes, just in case they get the deal that they are looking for from a a contending team. There have been rumours that the Canucks may try to re-sign Vanek, but the whole point of this season was the rebuild and if there is a package worthy of it, then the Canucks will make that deal. This is another skater-game lost for Benson, as his team is somewhat getting picked apart in this last week. At least with Vanek, he's healthy and should be ready to play, once all the dust settles.